What? How? The Waiver says you are accepting the risk for wrestling and you know it is dangerous. Yes, it does. Essentially those releases recognizing that every one of us that steps into a wrestling ring is accepting the risk. The acceptance of the risk for an inherently dangerous activity is a long-established defense and legal principle that essentially states we knew the job was dangerous when we took it. Therefore, when Johnny Goldfinger does an overhead back suplex to me that herniates three of my discs, I can not hold the promoter accountable any more than Joe Theisman can hold the NFL responsible for Lawrence Taylor snapping his leg like a snap pea. I thought so. So the waivers DO protect promoters? Protect them being held liable for injuries caused by a wrestling match that are foreseeable and a regular risk of the activity? Indeed, they can protect promoters from such liability. But, it does not protect promoters from their own stupidity. In other their words, their own negligence. But the waiver says that the wrestler is absolving the promoter of all negligence. It may say that. But, there is a public policy exception. As a general rule, we as a society do not want people to just contract away all responsibility, especially when there may be an unequal relationship between the parties. Accordingly, there are some things where businesses will find that its’ waiver is useless. Negligence is just such an area. Who is supplying the ring and are all parts in safe condition? Is the ring apron sanitary? Who is inspecting the equipment before each show? Who is inspecting the equipment after each show? What security precautions have been taken to protect the talent from unruly fans? What safety instructions were given to the talent prior to the show? What safety precautions have been taken to protect the fans ? Were the wrestlers on the card in a condition to work? Were any wrestlers under the influence of drugs or alcohol while performing and were their opponents aware of this before the match? You can say these are grown men and women all you want, but if a promoter is allowing impaired people to perform on his shows, he will soon learn that a good lawyer will crush those waivers like an apple in the hands of Danny Hodge. 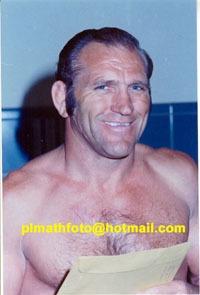 The legendary Danny Hodge, foe to apples everywhere.